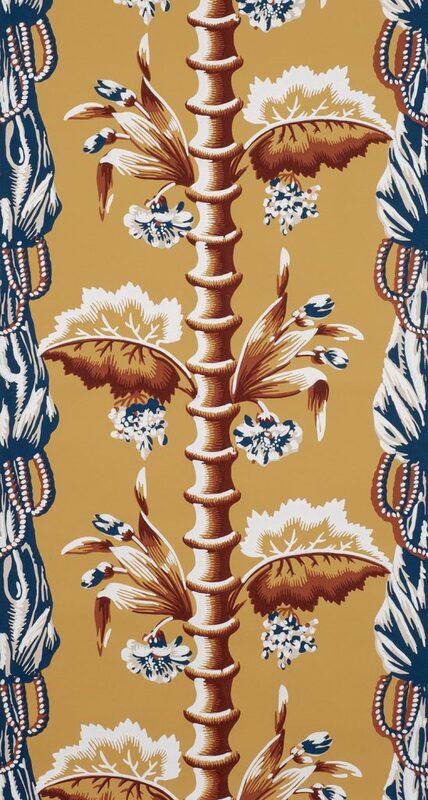 Bamboo and Drapery was printed by Moses Grant Jr., a highly successful Boston manufacturer. His papers have been identified in Charleston and Philadelphia as well as in New England, indicating a well developed distribution network. Grant offered a wide range of patterns including the latest fashions from France. 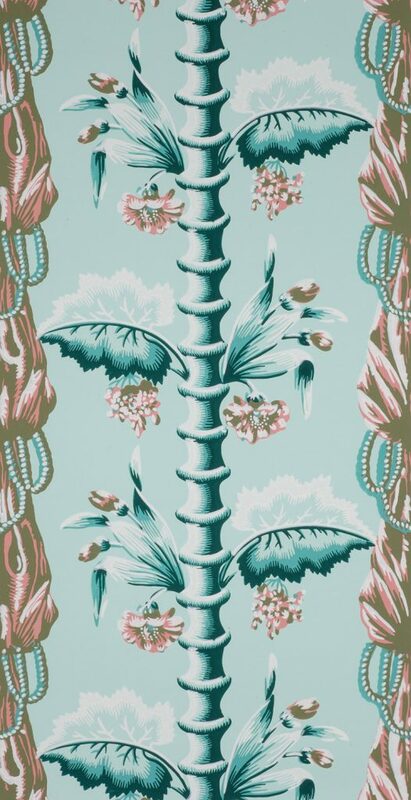 This pattern combines two very popular design motifs of the early 19th century. The first is the somewhat abstract, geometric “Harlequin” fashion popularized by the French around 1800. 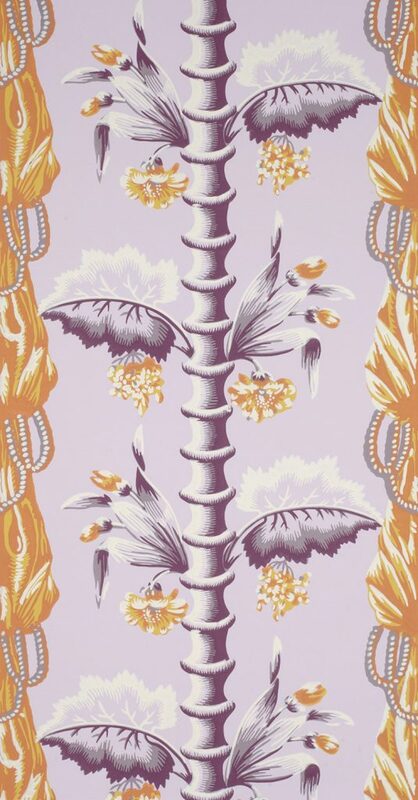 Copying French styles, American paperstainers printed many of these patterns from 1800-1820. The harlequin effect is achieved by splitting a motif symmetrically, in this case the leaves, and printing each half with contrasting colors. 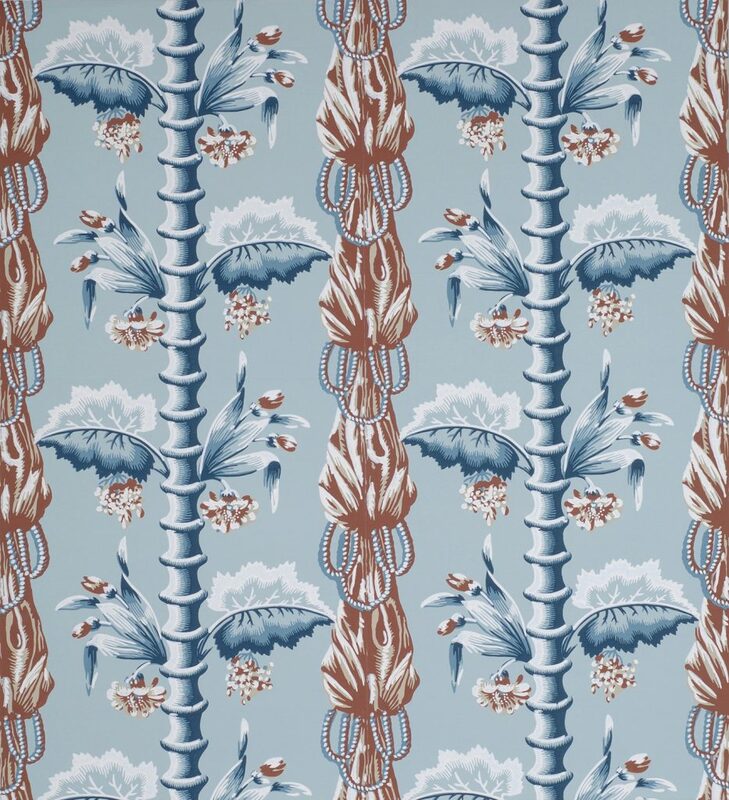 This pattern reproduction is based on wallpaper found in the Jackson House in Plymouth, Massachusetts, now in the collection of Historic New England. HNE collections also contain other versions from the Longfellow House in Portland, ME; the Corwin House (now called the Witch House) in Salem, MA; the first Harrison Gray Otis House in Boston; and the Moses-Pierce-Hitchborn House in Boston, located next to the Paul Revere house. Some of these were printed with fewer colors and one (an incomplete sample) boasts two additional colors. For historic installations this paper should be hung either with a narrow border around all margins or else with a combination of a broad festoon type frieze and narrow borders to trim the other margins. 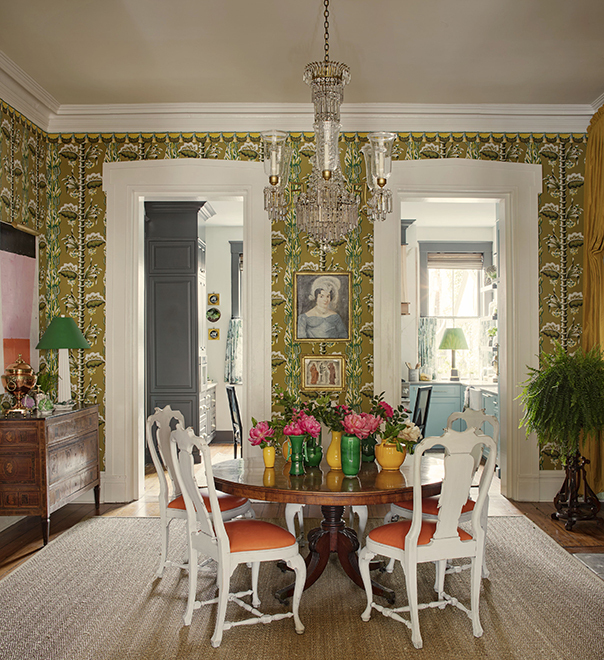 For contemporary setting borders are optional. Imperial Measurements: Repeat 21 ⅜ inches, width 21 ⅜ inches, length 11 yards, straight match. Metric Measurements: 54.3 cm, 54.3 cm, 10 m.